Say hello to the Microsoft Surface Pro 3. Yup, Microsoft just announced a brand new Windows 8.1 tablet at its press event, and, boy, does it have a lot going for it! In fact, Microsoft is promising that the Surface Pro 3 is capable of replacing a laptop, and that might turn out to be valid for many a user. So, what's so cool about the Microsoft Surface Pro 3? Well, the slate has adopted the magnesium casing and solid construction that the Pro 2 was known for. And to prove that the new model can handle more than a few bumps, one got dropped at the stage without suffering any damage. Furthermore, the Pro 3 weighs 800 grams, which makes it over 100 grams lighter than the previous model. At an impressive 9.1 millimeters, Microsoft's newest tablet is also much slimmer than its predecessor. Further design changes include an improved, multi-position kickstand. Now, a weight figure of 800 grams might seem like quite a lot for a tablet, but there's a bit that we haven't mentioned yet. The Microsoft Surface 3 comes with a 12-inch color-calibrated display with ClearType tech – up from 10.6 inches on the Pro 2 model. Interestingly, the screen now has an aspect ratio of 3:2, which has its benefits. Or as Microsoft puts it, the Pro 3's screen has 6% more area than that on an 13-inch Macbook Air. The resolution of the Surface Pro 3's display is 2160 by 1440 pixels, resulting in about 216 ppi. Under the hood of the Surface Pro 3 resides an Intel processor – up to a 4-th generation Core i7 with HD 4400 graphics, at that. Microsoft has managed to put Intel's powerful chip in its new tablet, thus making it the thinnest Core i7 device ever. Less capable, yet more affordable configurations will be available as well, packing an Intel Core i3 or an i5 processor. Up to 8 gigabytes of RAM can be tucked inside the device, and storage space options range from 64 to 512 gigabytes. To keep its cool even under heavy load, the Surface Pro 3 relies on a fan-based cooling system and vents placed around its sides. As powerful as it is, a Surface Pro 3 should provide up to 9 hours of web-browsing time on a single charge. 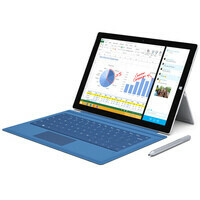 As for its multimedia capabilities, the Microsoft Surface Pro 3 comes with two 5MP cameras – one in the front and one in the back – paired with front- and back-facing microphones. The snappers can shoot 1080p video at 30 frames per second. Microsoft is also touting the tablet's upgraded front-facing speakers that are now 45% louder. Around the sides of the slate you'll find a microSD card slot, as well as a USB 3.0 and Mini Display ports. The range of accessories for the Microsoft Surface Pro 3 includes a Surface Pen, which comes in the box. As the name implies, it is a presicion stylus used for note-taking and drawing. What you won't get in the set, however, is the Type Cover detachable keyboard ($129.99). The Pro 3 variant of the accessory features a 68% larger touchpad. A docking station for the device will be offered as well, priced at $199.99. The Microsoft Surface Pro 3 will go on sale tomorrow, May 21. Pricing is as follows: the very base configuration, with a Core i3 processor, 4GB of RAM, and 64GB of storage, will cost $799, while a Core i5 model with twice the RAM and storage space will retail for $1299. There will be two Core i7 configurations with 8GB of RAM and either 256 or 512 gigabytes of storage for $1549 or $1949 respectively. Go MS! This is great. Good bye to my Samsung laptop, you served me well. I'm in now..... I can't wait to get this beauty. Great job ms. Didn't think I'll ever think about getting a Surface, but now I do :D Even though it can't replace my desktop, but it'll let me do some gaming on the go!! The real gaming, not mobile gaming. Come on MS you nailed this one. Cut the price at least. It is too much. Oh great, a fanboy of the Surface Pro 3 cooling system! All he did was state the price. Then suddenly he becomes a "fanboy". No other device is even near this innovation and powerful product. This device seems to be insanely engineered... Microsoft sets a new standard on the market. this is the greatest piece of tech I've ever seen! innovative, powerful, beautiful holy sh!t :D but I'm sure PA will review this and give it a 8.5 because it doesn't have an apple logo on it's back cover! anyway Microsoft did a gr8 job, well done! Yes, and specially because windows doesnt have as big store as the app store..
You're right, but the OS(Win 8.1) is far more versatile than iOS and even more than Android. I know of other site that will give it the same score since it doesn't say Nokia on top of the screen. It seems that MS want to anticipate the coming of iPad Pro. Ah, if they released one with 14 inches at least then I'd get it in a heartbeat, 12 inches is way too small for me.. Other than that though, it's frikkin amazing. Truly a magnificent achievement. Great job MS. So how about an LTE version? This is brilliant, and up to 8GB RAM!? It's a beastly thing, perfect balance between a laptop and tablet, it just made my iPad 4 feel a tad outdated and very much out powered, you can't actually compare a Surface Pro to a regular iPad or Android tablet. I think the only tablets in Android that come close to this are the Galaxy Note Pro line, specifically the Galaxy Note Pro 12.2 LTE. Excellent job MS, this is what the tablet space needed. Why not put SSDs in them? Beautiful!!! Welcome to the future geeks. I7 8gb ram 512gb-$1949. Thats overpriced considering that it has no dedicated GPU other than that crappy intel"HD". And wtf i7 in 9mm, definately an microwave, even with Haswell. Fail in my book. Here we go again. Its not my fault that MS didnt unveil surface mini. Dont get frustrated.